Ontario Premier Doug Ford is warning that the federal government's carbon tax risks triggering a recession, but it's hard to find economists eager to back up his claim. Ford used a speech to Economic Club of Canada to predict that Prime Minister Justin Trudeau's carbon pricing plan will hurt the economy . 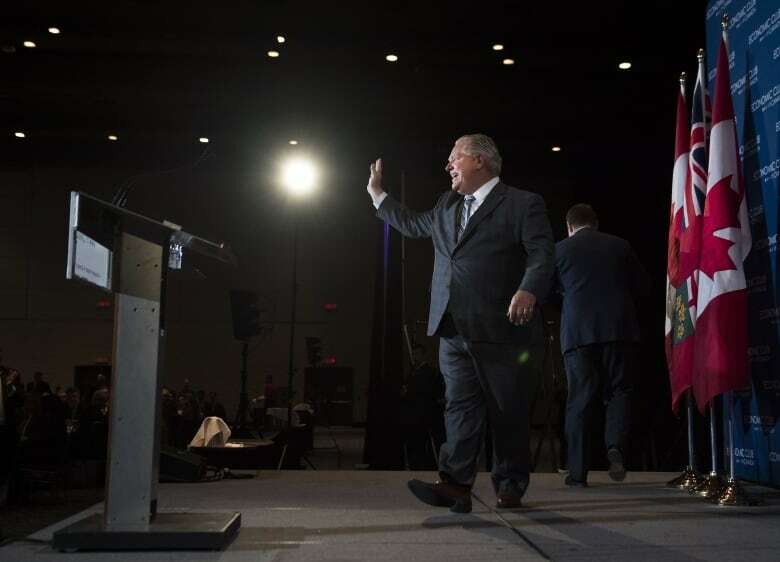 "A carbon tax will be a total economic disaster," Ford told the estimated 1,000 paying guests at the lunchtime event in downtown Toronto on Monday. "There are already economic warning signs on the horizon," he said. "I'm here today to ring the warning bell that the risk of a carbon tax recession is very, very real." Ford did not offer any details in the speech about how the carbon pricing scheme would lead to recession. He did not take questions from reporters afterward. Asked by CBC News for clarification, Ford's press secretary pointed to a study by the Conference Board of Canada that suggests a federally imposed carbon tax would shrink the nation's economy by $3 billion. While that sounds like a big number, it is only a fraction of a per cent of the country's $2.1 trillion GDP. "Our analysis suggests the economy will shrink marginally in response to the carbon tax," the authors said. "While the overall economic impact is small, the distribution is not equal across sectors, with some industries bearing notable costs." The report does not say that the carbon tax will cause a recession. Nor do other economists. In its most recent monetary policy report, the Bank of Canada lays out what it sees as the major risks to the economy in 2019. The looming carbon tax is not even mentioned as a factor. CBC News asked economists from four of Canada's big banks to weigh in on Ford's statement on Monday, but none agreed to comment. There's no evidence to substantiate Ford's claim, says Dale Beugin, executive director of Canada's Ecofiscal Commission. It's a group of economists specializing in economic and environmental policy, led by an advisory board that spans the political spectrum, including the former Reform Party leader Preston Manning. According to the Ecofiscal Commission's analysis, the likely economic impacts of carbon pricing will be modest. It forecasts the Canadian economy to grow slightly more slowly than it would have without a carbon tax but to remain "a very, very far step away from a recession," said Beugin. "That money being collected is not being burned, it is being sent back into the economy in different ways," Beugin said Monday in a phone interview with CBC News. He said the federal backstop model would keep the economy buoyant by sending carbon tax revenue back to households to be spent. He points to the experience of jurisdictions that have put carbon pricing in place. "Sweden is another example where we've seen a really high carbon price over time and the economy has continued to grow even as emissions have declined," said Beugin. Last week, a list of 45 senior economists from across the U.S. political spectrum published a statement in the Wall Street Journal endorsing a carbon tax, with all revenue given back to citizens. The list includes former White House economic advisers, treasury secretaries, Federal Reserve chairs and Nobel laureates. This will not likely be the last time you hear the phrase "carbon tax recession" from Ford. Two conservative strategists told CBC Toronto they expect the Ontario premier will continue to use this messaging in the coming months, as carbon pricing becomes a key issue in the federal election.